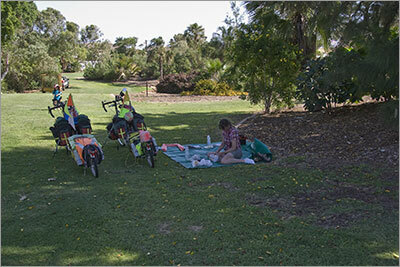 With not much to do until the bus arrived this evening we had a very easy day reading the newspaper in a coffee shop before going to Cattrall Park, a small picinic spot in Karratha, to spend the afternoon in the shade of a tree. It was a very nice relaxing day. We were amused that a couple of people thought we were spending the time at the park waiting for dark before we would pitch a tent and spend a free night camping. 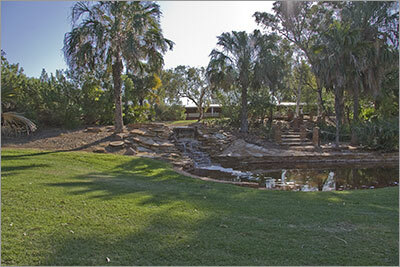 They were keen to tell us the sprinklers ran at night and it was recycled water. The Greyhound bus arrived on time and there was ample space for the bikes and trailers and the two drivers were very friendly and helpful. For the first time on a bus we received a safety commentary as the bus pulled out which was rather interesting. It was similar to a plane’s safety presentation except you are told how to open the door manually, where the fire extinguishers are and so on. All the trip south was in the dark and there were only a few highlights – there were three driver changes, the bus hit a small kangaroo and we went through a small patch of rain near Minilya. We cannot recall when we last saw rain.